The first poster in our guide to learning COBIT 5. 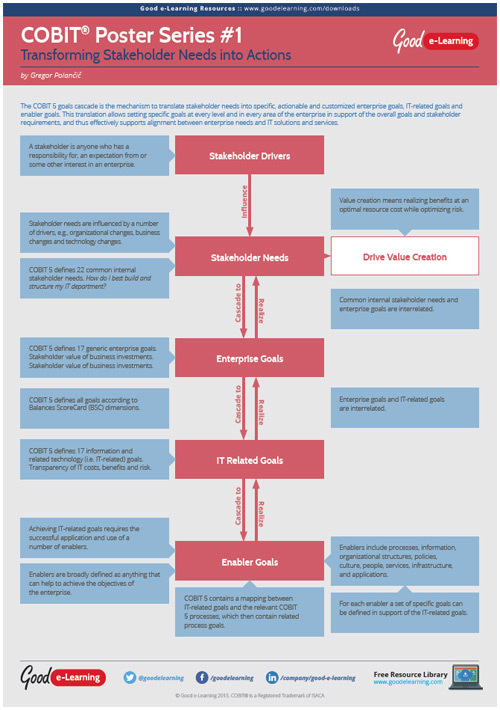 Here, we take a look at the 'Goals Cascade', a mechanism to translate stakeholder needs into specific, actionable and customized enterprise goals, IT-related goals and enabler goals. This translation allows setting specific goals at every level and in every area of the enterprise in support of the overall goals and stakeholder requirements, and thus efectively supports alignment between enterprise needs and IT solutions and services.